I'm a big fan of a good potato hash. I've posted a sweet potato version before but I'll usually just whip one up with white or golden yellow potatoes for a quick side dish. It's so easy, goes with pretty much everything, and you can add almost anything to the potatoes. I baked a ham the other day and since I have a bunch leftover, I'm making a few different things with the rest of it. One of the things I've made so far is a ham hash. 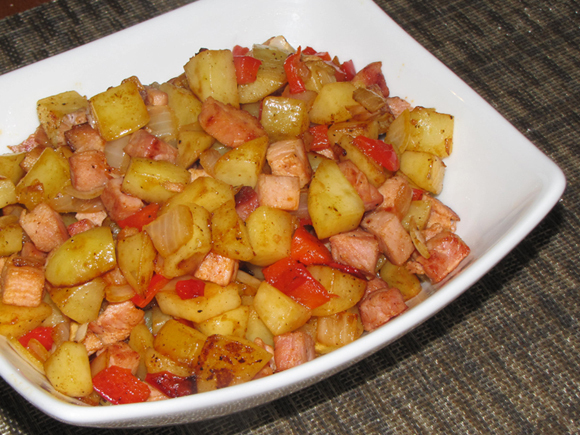 Ham and potatoes go very well together so it makes perfect sense to combine them in this simple dish that can serve as a main meal or as a side dish with...oh, let's say some of those leftover Easter eggs! 1. Dice the potatoes into 1/2" pieces. 2. Heat oil in large skillet then add potatoes. 3. Cook over med-high heat until starting to brown. 4. Add ham and cook for another couple minutes until ham is starting to brown. 5. Add pepper and onions and cook over medium to med-low heat until vegetables are softened.